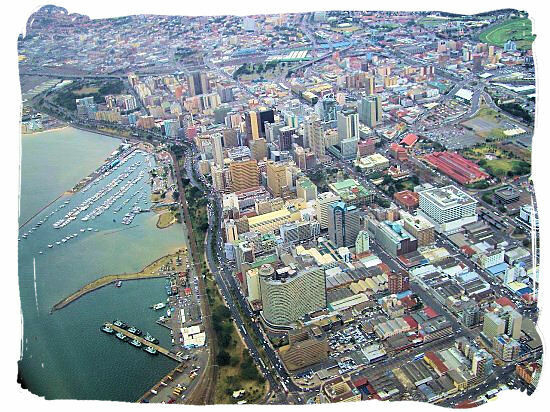 On the interactive map of Durban and its surroundings together with the other maps lower down on this page, the location of this great city is to be found on the East coast of South Africa in the Kwazulu-Natal province at 29° 53' S and 31° 03' E.
In 2000 it became part of the greater Durban area known as the eThekwini Metropolitan Municipality, comprising the city of Durban and the surrounding towns and townships. 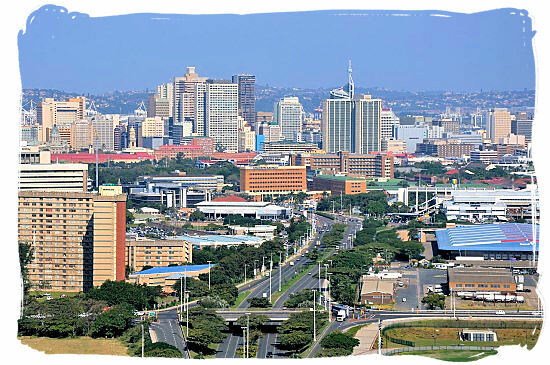 eThekwini encompasses an area of approximately 2300km2 with a population of approximately 3,100,000 people and includes a relatively narrow coastal plain that stretches along the shoreline for 98km. The Metropolitan area is topographically hilly and the undulating nature of the landscape has significantly influenced the city's development. The area is bordered by the Indian Ocean with its warm, south flowing Agulhas current on the East and the Drakensberg Mountains, one of the most beautiful and picturesque mountain ranges in Africa, on the West. To the South, a range of rolling hills called the Bluff separate the sea from Durban Bay, making it a naturally formed harbour. 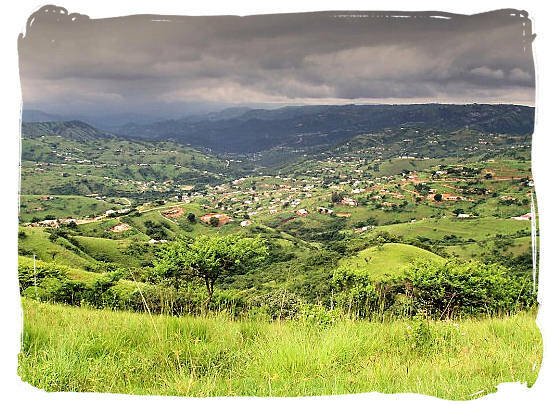 As these hills stretch further North past the Umgeni River to the Northern suburbs of Durban North and Umlhanga, they become fields of abundant sugar cane which surround the North Coast beaches. Along the coastal regions beautiful beaches are surrounded by indigenous bush and lush tropical vegetation. The notable offshore geographical features in this area are Aliwal Shoal in the South and Sodwana Bay Reef in the North, two incredible world class diving sites. Inland lies the Berea area, a ridge of hills, which encircles the flat locations in the vicinity of the Central Business District and the harbour area. The Western suburbs of Kloof and Hillcrest, which lie off the famous Fields Hill, are significantly higher than sea level. As you pass through the community of Bothas Hill, which is approximately 850metres (2789 feet) above sea level, you encounter the dramatic landscape of the Valley of a Thousand Hills, a magnificent and majestic valley formed by the Mngeni River and its tributaries, which creates the backdrop for the spectacular Midlands Meander Trail. The Greater Durban region boasts a multitude of interesting geographical features including waterfalls, rivers, ravines, gorges, dams, valleys, and nature reserves, making this a breath taking place to visit. The following are a number of interactive Google maps which will enable you to explore your subject of interest from satellite view to as close as street view following the navigation instructions. 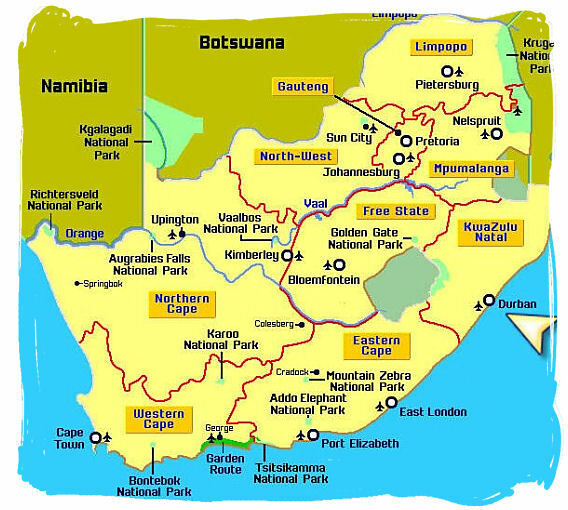 Map of Southern Africa showing the location of Durban. Map of the eThekwini metropolitan area. View a larger version to see the exact border of the metropolitan area. Map of Durban showing its surrounding suburbs.